Amplify releases Tom at the Farm at Village East Cinema on August 14th, 2015. NYC MOVIE GURU: How challenging is it to direct yourself in your movies? Xavier Dolan: The only way I can approach filmmaking is through acting, so it is never weird or demanding for me to be acting in one of my movies. I'd rather be directed by someone else because then you have someone else to please. To please yourself is a thing that's sometimes hard to judge, but I don't have a hard time looking at myself and thinking, "I was really bad in that scene." I think of filmmaking when I act. I've experienced so many problems editing the scenes and cutting the movie before with actors, so when I'm acting, I'm also thinking about the editing. It becomes a very conscious performance. As much as I want it to be natural, I just can't help but think organically about other departments and other things. XD: The movies that I really like are the movies that start out with a problem that needs to be solved. 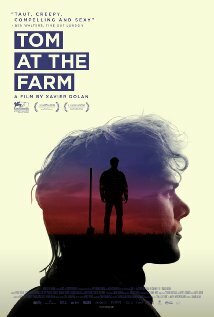 Tom at the Farm is my darkest film, generally speaking. I'm thinking of Mommy as a rather luminous movie---the colors are bright and buoyant. But this one is very dark and gritty. I'm appealed to it for many reasons, aesthetically and psychologically. I think there's much more depth in dark matters. I would love to direct a comedy, but right now that's not what I'm thinking of. I love to laugh--that's what life is made of: contrasts. That's normal. NYC MOVIE GURU: Why did you decide to include a lot of music in the movie? XD: As much as I was striving for no music, it just didn't work. It's a psychological thriller, and I thought that no music would be worrying and eerie and would make people anxious. It would was just long, boring and silent. As soon as I started cutting the movie, I realized that I really needed music and started spraying the film with music everywhere. Every scene has music. The score in Tom at the Farm is different from my score from any of my other movies. I never hired any professional composers for my other films before, so it was the first time I was working with a true professional. [Composer] Gabriel Yared gave this film musicality and its voice, literally. When I heard the tracks, I was literally dumb-founded. When I heard his score, I felt like I was true director. It was because of him. NYC MOVIE GURU: In what ways is the movie different from the play? XD: The play is much more humorous than the movie. It's much lighter. It's a little bit harder to convey fear onstage than in film. You're watching, but not feeling such strong things. There are 10 scenes in the play, but 100 scenes in the movie which is normal. You have to make the leap to the big screen. In order to do that, I thought that the country house would be much more terrifying as a place and as a character, too, I think, if we would leave it. The fact that we're going to the church and the city and the bar just seemed necessary to give a bit of air to let the scenes breathe, and to make the house a truly terrifying place to go back to instead of staying there the whole time. NYC MOVIE GURU: Is it true you cast your father in Tom at the Farm? XD: Yes, he's the bar owner. It's my favorite scene in the movie. NYC MOVIE GURU: How challenging is it to know when to trust the audience's patience and intelligence? XD: I think it would be very challenging if I truly tried to venture into a sort of projection into the public. I'm just questioning the public as myself: how I would be reacting. I trust the public to have similar projections to mine, similar feelings and similar apprehensions and expectations when it comes to the story. I have never made any for the public thinking, "How will the public be reacting?" But I'm thinking of the public because I'm thinking about how my mother, father, and I will be reacting. I believe that the three of us encompass a vast majority and variety of opinions and sensibilities--three very different sensibilities. I never try to please anyone else. I do read every review of my movies. With time, you learn how to let go of hateful and truly heinous reviews because you can't grow through that type of reading. But there are others that are quite negative, but very educational. I've always read those. They have taught me a lot as much as some comments from the public on blogs. I want to know how people see what I see because otherwise, I'm just a blind person. I trust my own judgement to create films with integrity and what I believe to be the right answer. So, I try to do my own thing without conforming myself to standards or more traditional filmmaking. I don't even ask myself what's traditional and what's not or what's independent and what's commercial. I don't believe in those to categories. That's solely financial talk. I hate the term "indie movies."